Welcome to the very last In-Process for 2017! Wow, what a year it’s been. 24 issues of In-Process since it started on the 30th January, over 18,000 words, 4 NVDA releases (and hundreds of snapshot builds for those interested in trying pre-release features). We’ve had a lot of great community discussion, participation and fun. We’ve been to NVDACon, joined Joseph Lee’s DevLearning group to learn to write add-ons and represented at various conferences and speaking opportunities. Of course, the best promotion we could hope for is the wonderful advocacy that you, our fantastic community do naturally every day! Thank-you, one and all for all your enthusiasm for NVDA and support of NV Access in 2017! The year isn’t over just yet and there are still exciting things going on to share. The most noteworthy this fortnight being the release of NVDA 2017.4. Thank you to everyone who tried “Next” and “Master” snapshots, and more recently the “Release Candidate” builds. You have helped to make NVDA 2017.4 an exciting release to end the year on. There are a couple of things to be aware of with NVDA 2017.4. This release now requires Windows 7 with Service Pack 1 or later. Although newer Windows 7 CDs should include SP1, if you are reinstalling from an older CD or image, it may not, and NVDA 2017.4 won’t install until SP1 is installed. A number of users have experienced various random things not working correctly just after installing NVDA and before restarting the computer. Often NVDA will run fine straight after installing, but particularly with 2017.4, we recommend restarting the computer after installing. This release we have also updated the eSpeak NG synthesizer from 1.49.1 to 1.49.2. While this has fixed some issues with eSpeak NG, some users have reported new issues in various languages. Although issues with eSpeak NG specifically need to be addressed by the eSpeak NG project, do keep reporting them to us as well as it’s good for us to be aware of the issues. You can report issues with eSpeak NG directly to the eSpeak NG project on GitHub. The NV Access team are taking time off over Christmas. While we won’t be as closely monitoring e-mail or social media, we want to encourage everyone to be active in the user E-mail group. The group is a great way to chat to other users, get help with problems, share tips and ideas and receive assistance. Join the e-mail group on Groups.io. If you do have something that needs attention from the NV Access team, email us and we will get to it as quickly as possible upon our return mid-January. The NVDA Expert (with Microsoft Word) certification has proven quite challenging for users. For those who have sat the exam so far, we’d be happy to get feedback on how you found the exam – is it harder than expected, easier? How does it compare to the original in terms of difficulty? For those who haven’t yet sat the exam, perhaps our Official training materials or becoming one of the first NVDA Expert (with Microsoft Word) certification holders is on your Christmas wish list? Remember before completing the NVDA Expert (with Microsoft Word) certification, you need to pass the original NVDA Expert certification. To end the year, here are some more statistics for 2017? NVDA 2017.3 was downloaded over 153000 times with 70% of downloads due to automatic updates. NVDA 2017.4 has already been downloaded over 34000 times, with 90% of these downloads due to automatic updates. The top 4 countries using NVDA are India, the United States, Brazil and France. Most notably is India which has had a massive growth of over 8000 active users just in the last quarter. And finally, a very big thank you to our wonderful donors! Users from the United Kingdom are the most likely to donate when downloading NVDA. We currently have 170 active monthly donors. 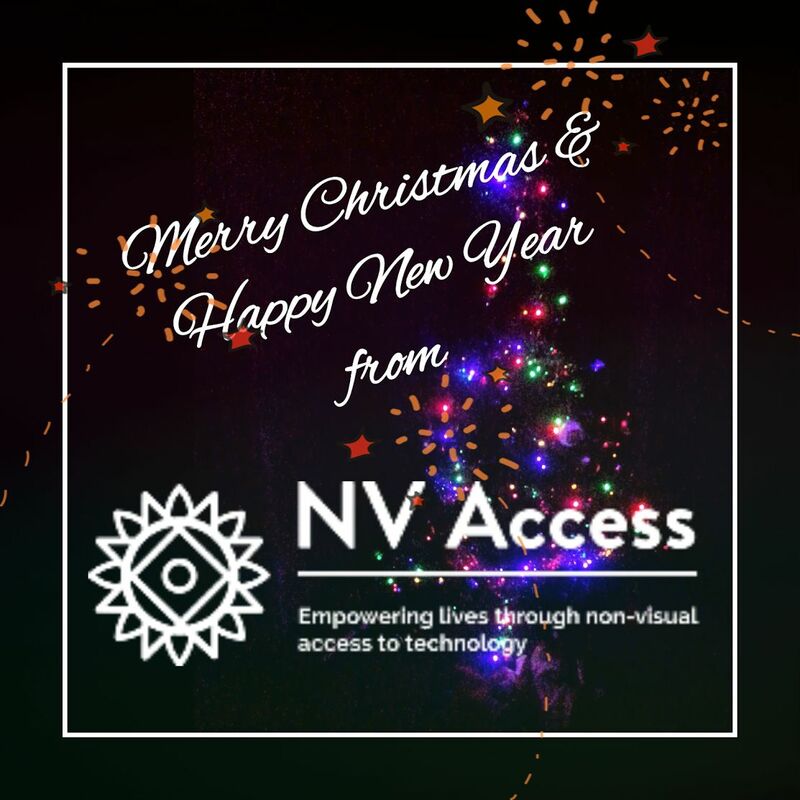 Have a wonderful Christmas and New Year from all of us at NV Access! We look forward to continuing with you on your journey in 2018!